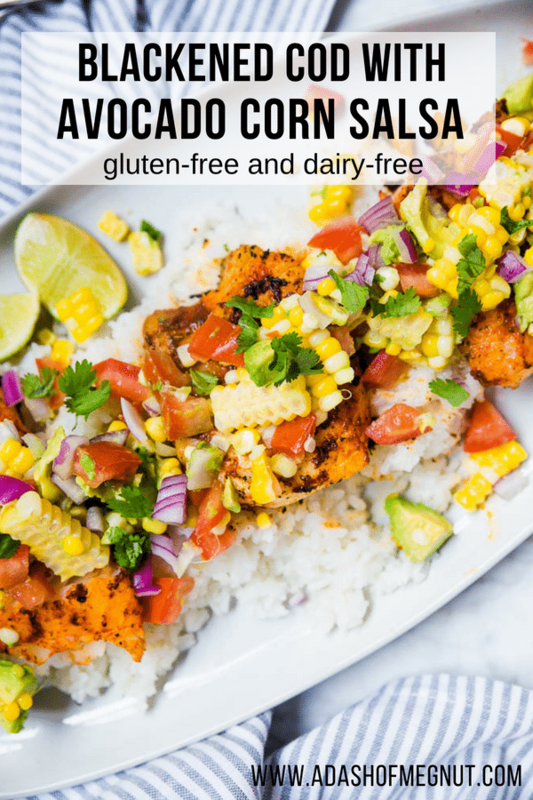 Blackened Cod with Avocado Corn Salsa - Ready in Under 20 Minutes! You don’t need a grill to make this easy blackened cod with avocado corn salsa. All you need is a skillet! Did you know you can make this healthy seafood dinner in less than 20 minutes? It’s true! Fresh and vibrant and full of flavor. 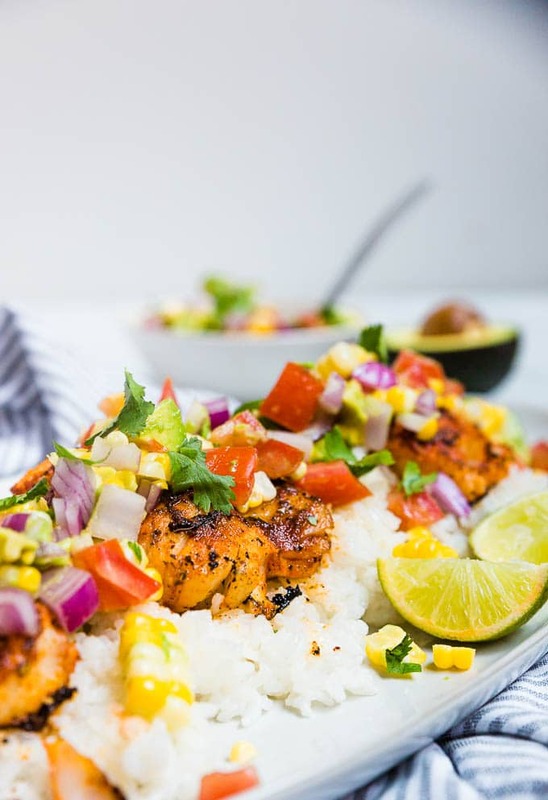 You’ll become a seafood lover with this healthy gluten-free dinner recipe that is perfect for weeknight meals or entertaining! During the summer, I don’t like to turn the oven on too much to make dinner. So my dinner go-to’s consist of quick and easy stove top meals that can be ready in under 20 minutes. That’s what everyone kind of wants, right? Something quick to put on the table with minimal effort? This blackened cod with avocado corn salsa certainly fits the bill. Throw in the fact that this recipe is also gluten-free and dairy-free and we have ourselves a winner here. We love to eat fish in our house. It’s quick, easy and delicious. Not to mention, we’re trying to incorporate more lean proteins into our diets. Seafood is definitely something that I think people shy away from making because it seems complicated, but really it’s so easy! I’ll show you how to make a blackened seasoning for the cod, how to cook the cod on the stovetop in a skillet and how to know when your cod is cooked! I swear this recipe will make a seafood lover out of anyone! It has a little bit of heat from the blackening spices, but it’s balanced SO WELL with the avocado corn salsa. 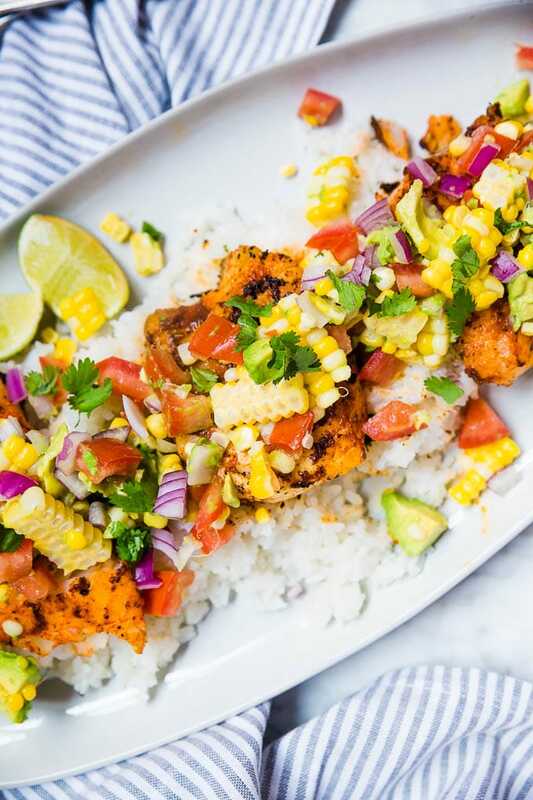 Throw avocado and corn on anything and I swear I’ll eat it – but especially this blackened cod recipe. The fish is cooked for 3-4 minutes on each side in a skillet on the stovetop. Then it’s topped with this fresh and vibrant avocado corn salsa. Easy peasy! 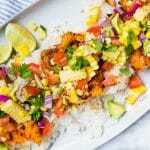 Combine corn and avocado with red onions, tomato, cilantro, lime and salt and you have an avocado corn salsa that is vibrant and full of flavor. Plus, it only takes about 5 minutes to throw together making it a easy topping for any protein. If I haven’t told you this already, I’m known for my love of avocados. In fact, a few people in the break room used to call me avocado lady at my last job. I’m not even sure if they ever learned my real name. As far as nicknames go, avocado lady is a pretty decent one so I’ll take it! Even the non-avocado obsessed guy in my house is in love with this avocado corn salsa though. So it’s not just for the avocado obsessed, I swear. To make this cod “blackened” we’re using spices such as paprika, chili powder, ground black pepper, oregano, cayenne pepper, garlic powder, onion powder and salt. I know it sounds like a lot of spices, but trust me, it’s worth it! I like to quadruple the spice mix and keep it on hand for whenever I want to make blackened seafood or even chicken! If you don’t want the spice mix to be as spicy, just omit the cayenne pepper. You can also add a little bit of brown sugar to balance the heat. Mix together your spices with a little oil to create a marinade for the cod. Then brush it on both sides of the cod. I like cooking seafood because it’s easy to tell when it’s done cooking. There are multiple methods to help decipher if your cod is cooked on the stovetop. Remember, seafood cooks quickly and is easy to overcook, so keep an eye on it. Cod, as with all seafood, should be cooked to an internal temperature of 145F. Insert a instant read thermometer into the center of the fish. If it reaches 145F you’re good to go! When fish is cooked it becomes opaque. If you look at the fish and it is still translucent in parts (especially in the thickest part of the fish), then continue cooking for a few more minutes. Another simple way to decide if your cod is cooked without a thermometer is to use the simple fork test. Cooked fish is easily flaked with a fork. Take a fork to the thickest part of the fish and prod at it at a 45-degree angle. If the fish easily flakes, it’s ready. If it resists, the cod still needs more time to cook. Other Gluten-Free Seafood Recipes You’ll Go Crazy For! 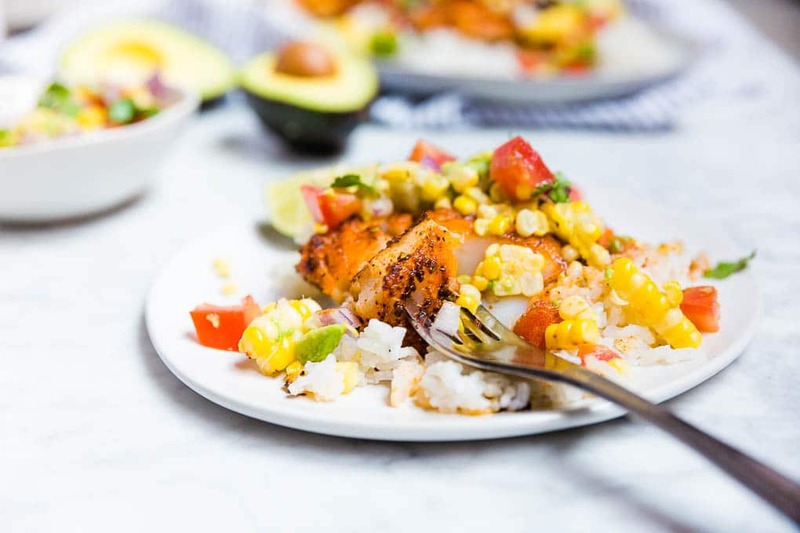 If you’re looking for a quick dinner recipe to get on the table in under 20 minutes, this blackened cod with avocado corn salsa is for you! It’s easy, healthy and delicious. Not to mention, it’s also gluten-free and dairy-free! Spiced to perfection and full of flavor, you’ll love how fresh and vibrant the salsa tastes on top of this blackened cod. 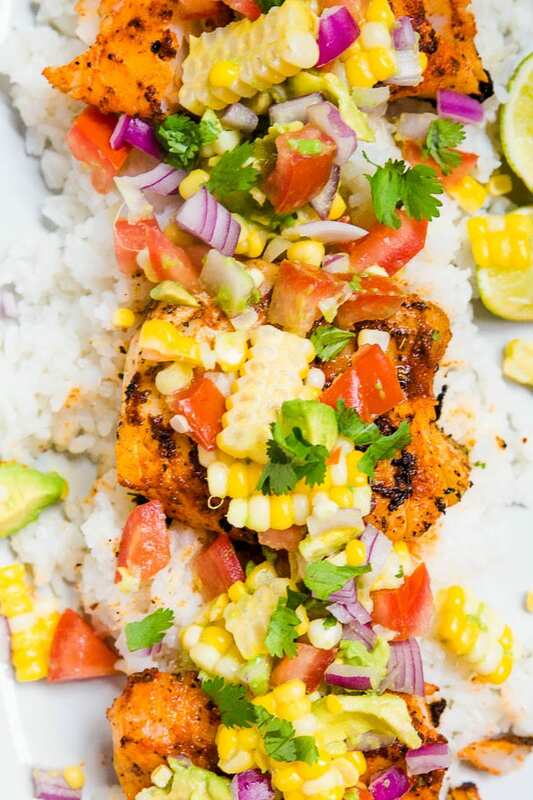 You don't need a grill to make this easy blackened cod with avocado corn salsa. All you need is a skillet! Did you know you can make this healthy seafood dinner in less than 20 minutes? It's true! Fresh and vibrant and full of flavor. You'll become a seafood lover with this healthy gluten-free dinner recipe that is perfect for weeknight meals or entertaining! In a small bowl, mix together paprika, chili powder, garlic powder, salt, black pepper, oregano, onion powder, and cayenne pepper until combined. Stir in avocado oil or olive oil. Brush both sides of each cod filet with the oil mixture. Add cod filets to the skillet and cook for 3-4 minutes on each side, until cod is cooked through. Cod should reach an internal temperature of 145F and the flesh should be opaque and easily flaked with a fork. While the cod is cooking, prepare the avocado corn salsa. Add corn, avocado, tomato, red onion, cilantro, lime juice and salt in a bowl. Stir to combine. Taste and add lime and/or salt as needed. Top the blackened cod filets with the avocado corn salsa and serve. I could eat just a bowl of the salsa! So good! Yess! The salsa is probably my favorite part!